Objectives: Studies have reported changes in leptin and adiponectin levels in the gingival crevicular fluid, saliva, and blood serum of obese patients with periodontal disease. The aim of the study is to evaluate serum leptin and adiponectin levels in obese and nonobese individuals with chronic periodontitis and to deduce a relationship between the clinical parameters and the inflammatory biochemical parameters. 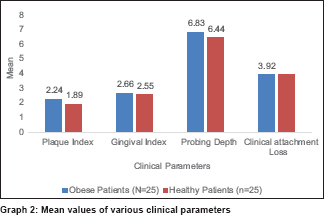 Materials and Methods: In this case–control study, a total of fifty individuals were selected based on the body mass index (BMI): Group I of obese individuals with chronic periodontitis and Group II of nonobese individuals with chronic periodontitis. Periodontal parameters used in this study were plaque index, gingival index, probing pocket depth, and clinical attachment level. The effects of obesity and periodontal status on serum leptin and adiponectin levels of both groups were statistically analyzed using an independent t- test. Results: Statistical analysis showed that the effect of BMI on serum leptin and adiponectin levels was statistically significant (P < 0.01), and the effect of chronic periodontitis on the serum leptin and adiponectin levels was also statistically significant compared to nonobese individuals (P < 0.0001). However, there is no statistically significant correlation between serum leptin and adiponectin, which indicates that both are independent to each other. Conclusions: In obese individuals with chronic periodontitis, serum leptin levels were significantly high compared to nonobese individuals and serum adiponectin levels were significantly lower in obese individuals compared to nonobese individuals with periodontitis, though both the parameters were independent of each other. Periodontal problems are part of health issues having implications on systemic health, rather than just general oral health problems. Obesity that is of late considered a health issue, primarily caused by the changed lifestyles, is related to periodontitis when studied in terms of the obese individual's body mass index (BMI) using parameters such as ratio of waist-to-hip circumference, fat content in the body, and consumption of oxygen. Based on these findings, certain conditions associated with periodontitis can aggravate obesity, as could be seen from “the metabolic syndrome,” dyslipidemia clustering, and insulin resistance. Of these diseases linked to obesity, the potential danger of cardiovascular diseases (CVDs) is shown to have been influenced by periodontitis., Obesity is a condition similar to overall inflammation, occurring with metabolic and immune characteristics, rendering one susceptible to periodontal disease. To establish these connections of chronic inflammation such as periodontitis and obesity, several hosts of mediators have been recognized. Functioning as endocrine organ, adipose tissue is a connective tissue, loose in nature, and its adipocytes not only function as a passive triglyceride reservoir but also generate cytokines and hormones which can result in erratic responses of immunity. Adipokines perform a number of different roles like the ones played by leptin and adiponectin, wherein they function as hormone like proteins. These adipocytokines play an important role in initiation of periodontal disease by activating monocytes, which increases the production of inflammatory cytokines. Release of inflammatory cytokines causes an alteration in the host immune responses that links to a higher susceptibility to bacterial infection. Leptin enhances the host immune mechanism by activation of monocytes and macrophage and manages activities such as phagocytosis, cytokine production, chemotaxis, and regulation of oxidative species stimulated by neutrophils, development of natural killer cells, shift of T-cell responses toward Th1 cytokine type, and inhibition of Th2 cell type. Adiponectin is produced primarily by adipocytes, and its plasma levels decrease in obese individuals as compared to normal-weight individuals. It has certain constructive outcomes such as anti-inflammatory, vasoprotective, and antidiabetic effects. These defensive effects occur due to suppression of tumor necrosis factor-α and interleukin-6, along with induction of interleukin-1 receptor antagonist. Iwayama et al. demonstrated that adiponectin exerts anti-inflammatory effects on human gingival fibroblasts and mouse gingival fibroblasts and promotes osteoblastogenesis of human periodontal ligament cells and concluded that adiponectin has potent beneficial functions to maintain homeostasis of periodontal health which contributes to wound healing and tissue regeneration. This cross-sectional study was approved by the Ethical Committee of Mamata Dental College and Hospital, Khammam, Telangana, India. The individuals participating in the study were volunteers who received detailed information regarding the proposed research and provided signed informed consent. Twenty-five systemically healthy individuals, 19 males and 6 females, 25–65 years old (mean age: 43.24 years), comprised the control group; 25 obese individuals, 18 males and 7 females with mean age of 54.92 years, comprising the test group participated in the study. These individuals were selected from an initial sample of 66 patients who were referred for periodontal treatment to the Outpatient Department of Periodontics, Mamata Dental College and Hospital, Khammam, from March 2017 to June 2017. The patients enrolled in the study met the following inclusion criteria: (1) age >25 years; (2) the presence of at least 15 teeth, excluding third molars, (3) nonsmokers, and (4) normal weight or obese Type I or II status. All consecutive patients who met these inclusion criteria were invited to participate in the study and 25 individuals were randomly allocated in the test group, i.e., obese patients with chronic periodontitis and 25 individuals in the control group, i.e., nonobese individuals with chronic periodontitis, respectively, using a coin toss method. The study design was double-blinded randomized study to avoid bias. Of the 66 individuals screened, 16 failed to meet the required inclusion criteria. Patients with a diagnosis of gingivitis or aggressive periodontitis or a known systemic disease such as acquired immunodeficiency syndrome or diabetes mellitus, pregnant/lactating, currently undergoing orthodontic treatment or submitted to periodontal therapy during the previous 6 months, or having undergone antimicrobial, anti-inflammatory, and/or immunosuppressive therapies during the previous 6 months were excluded from the study. BMI was calculated based on the each individual's weight in kilograms divided by the square of his height in meters (kg/m2). Weight and height measurements were performed by a single, trained examiner. Obesity was defined according to the World health organization (2012) as Type I (i.e., BMI ≥30 kg/m2 but <35 kg/m2) or Type II (i.e., BMI ≥35 kg/m2 but <40 kg/m2). Patient's account of his/her medical history was taken systemic diseases was assessed. The clinical periodontal parameter measured were gingival index (GI) of Loe and Silness, plaque index (PI) of Silness and Loe, probing pocket depth (PD) measured from the gingival margin to the base of the periodontal pocket and clinical attachment level (CAL) measured from a fixed reference point of cementoenamel junction to the base of pocket/gingival sulcus. PD and CAL were measured at six sites per tooth (mesiobuccal, buccal, distobuccal, mesiolingual, lingual, and distolingual). A standard UNC-15 probe (University of North Carolina) was used for the measuring periodontal parameters. All recordings were performed by a single experienced clinician to avoid any interobservational bias at the single session, twice over a gap of 30 min. Two milliliters of blood was collected from the antecubital fossa by venipuncture using 20 gauge needle with a 5 ml syringe. Blood sample was allowed to clot at room temperature, and after 1 h, serum was separated from blood by centrifuging at 3000 rpm for 5 min and 0.5 ml of the extracted serum was immediately transferred to 1.5 ml aliquots. Each aliquot was designated a tracking number and stored at −80°C until further analysis. Since adipokines form important biomarkers, knowing the normal values of the same would be significant in correlating it with specific metabolic states that could have the potential to impacting directly on the metabolic homeostasis of the system. Obesity and CVD are a few to mention to show dysregulated levels of adipokines among a vast number of other pathological changes. Highly sensitive enzyme-linked immunosorbent assay (ELISA) kits were used to detect serum leptin levels as prescribed by the manufacturer. Each plate was checked before use, to ensure that the calibration curve measured leptin standards (0–1000 pg/ml) within the stated limits of the assay. Absorbance of the substrate color reaction was read on ELISA reader. The total leptin was determined in picograms (pg), and calculation of concentration in each sample was performed by dividing the amount of leptin by the volume of sample (pg/ml). Serum adiponectin Acrp30 concentration was measured by immunoassay method using a commercially available human adiponectin ELISA kit. According to the manufacture's guidelines, the lowest detectable level of serum leptin was 0.2 ng/mL. Monitoring the levels of adiponectin and its receptors, namely Adipo R1 and Adipo R2, is promising target for prevention and treatment of obesity, insulin resistance, hyperlipidemia, and atherosclerosis. Data entry and analysis were done using the SPSS version 22.0 IBM SPSS (IBM Inc. Chicago, USA). Descriptive statistics, such as mean and standard deviation (SD) for continuous variables and frequency and percentage for categorical variables, were determined. The data were found normally distributed. Independent t-test was done for intergroup comparison. [Table 1] and [Graph 1] shows the mean and SD of the age and BMI. 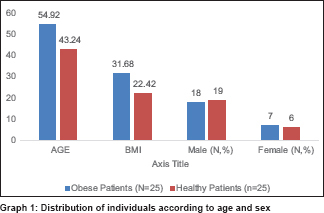 There is statistically significant difference present in age and BMI in obese and nonobese individuals with periodontitis, with higher mean values seen in obese individuals. [Table 2] and [Graph 2] shows the comparison of mean values of various periodontal clinical parameters in both the groups. There is statistically significant difference present in the mean PI scores and mean GI scores in obese individuals with chronic periodontitis than in nonobese individuals with chronic periodontitis, showing higher scores in the former group. [Table 3] and [Graph 3] shows the mean and SD of various biochemical parameters in obese chronic periodontitis group and nonobese chronic periodontitis individuals, wherein it can be inferred that there is highly significant difference in the mean serum leptin levels in obese and nonobese patients, with higher values of leptin in obese patients and decreased adiponectin in obese individuals with chronic periodontitis. 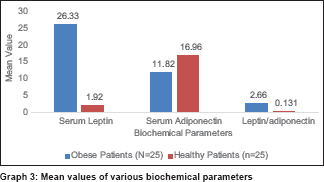 Correlation of serum leptin values with clinical parameters in obese chronic periodontitis group is shown in [Table 4], which inferred that there is a statistically significant correlation between serum leptin values and the various clinical parameters. From [Table 5], statistically significant correlation between serum adiponectin values and various clinical parameters such as GI and PI was seen. However, no statistical difference was seen between probing depth and clinical attachment loss. 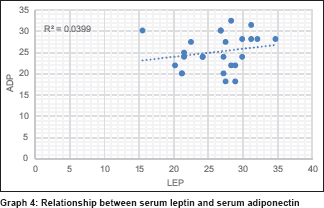 [Graph 4] represents the relationship between serum leptin and serum adiponectin. The means ± SDs of serum leptin levels in obese individuals and nonobese individuals with chronic periodontitis were 26.33 ± 4.47 pg/mL and 1.92 ± 0.55 pg/mL, respectively. The means ± SDs of serum adiponectin levels in obese individuals and nonobese individuals with chronic periodontitis were and 11.82 ± 5.13 pg/mL and 16.96 ± 4.69, respectively. Statistical analysis showed that the effects of BMI on serum leptin and adiponectin levels were statistically significant (P < 0.01), and the effects of chronic periodontitis on the serum leptin and adiponectin levels in obese individuals with chronic periodontitis were significant compared to nonobese individuals with chronic periodontitis (P < 0.0001). However, there is no statistically significant correlation between serum leptin and adiponectin, which indicates that both are independent to each other as assessed from [Table 6]. Obesity is considered a medical condition of accumulation of excess body fat which may have adverse effect on one's health, leading to reduction in life expectancy and associated health problems, defined in terms of BMI and evaluated in terms of distribution of fat via waist–hip ratio and total cardiovascular risk factor. Obesity may also influence periodontal disease status by increasing lipid and glucose blood levels, which may, in turn, have deleterious consequences on the host response by altering T cells and monocyte/macrophage functions, as well as increasing cytokine production. A variety of potential mechanisms can explain an association between obesity and periodontitis. The biological mechanisms for association of obesity with periodontitis are not well established. However, adipose tissue-derived cytokines and hormones may play a role. Overweight in young individuals may have unhealthy dietary patterns such as insufficient micronutrients and excess sugar and fat content, which may increase the risk for periodontal disease and also changes in host immunity and/or increased stress levels, that are often associated with gain of excess fat in early part of life. Iwayama et al. established that adiponectin with its potent beneficial function can maintain homeostasis of periodontal health, improve periodontal lesion, and has wound healing effects besides supporting periodontal regeneration. Singh et al. did a study to evaluate the relationship between obesity and periodontitis and showed that the prevalence of periodontitis was significantly more in obese than in nonobese individuals. It was concluded that strong correlation exists between obesity and periodontitis and stated that obese with high serum triglycerides and low-density lipoproteins could be at higher risk of periodontitis. Palle et al. demonstrated a significant association between measures of overall and abdominal obesity (BMI and waist circumference) and periodontal disease showed significant association. In a review of seventy cross-sectional studies, systematically conducted by Chafee et al., association between chronic periodontal disease and obesity, with strong association across people from diverse backgrounds, was seen. Obese patients are likely to have more incidence of periodontal disease, though no evidence is currently available to recommend differences in treatment planning. Keller et al. studied eight longitudinal and five interventional reviews, of which two of the longitudinal studies showed a direct association between obesity and the risk of developing periodontitis and three studies found to have a direct relationship between obesity and development of periodontitis among the adults. Leptin plays an important role in regulating energy intake and consumption, including appetite and metabolism. However, in relation to periodontitis associated with obesity, the same still needs to be examined. Karthikeyan and Pradeep reported that serum leptin levels increase in periodontitis. Adiponectin is a protein hormone that modulates a number of metabolic processes, including glucose regulation and fatty acid catabolism. There is an inverse association between adiponectin and markers of inflammation. Yamaguchi et al. showed that adiponectin might not function efficiently in periodontal disease sites owing to reduced number of receptors, and this might occur in worsening of periodontitis. Obesity is a complex and multifactorial disease. Its relationship with periodontal disease and other chronic disease is well documented, but underlying mechanism is under investigation. Information at a chronic level is multidirectionally linked to periodontal diseases, obesity, and associated conditions, and a periodontist can share related information with the patients as to help improve oral and general health of the patient. This study highlights the significant roles played by serum levels of leptin and adiponectin in pathogenesis of periodontitis and the levels that appear to be indicative to disease occurrence. Kaur G, Gupta ND, Goyal L. Obesity and periodontal disease. Indian J Dent Sci 2010;2:33-5. Joshipura K, Ritchie C, Douglass C. Strength of evidence linking oral conditions and systemic disease. Compend Contin Educ Dent Suppl 2000;12-23. Altay U, Gürgan CA, Ağbaht K. Changes in inflammatory and metabolic parameters after periodontal treatment in patients with and without obesity. J Periodontol 2013;84:13-23. Vielma SA, Klein RL, Levingston CA, Young MR. Adipocytes as immune regulatory cells. Int Immunopharmacol 2013;16:224-31. Deng Y, Scherer PE. Adipokines as novel biomarkers and regulators of the metabolic syndrome. Ann N Y Acad Sci 2010;1212:E1-9. Deschner J, Eick S, Damanaki A, Nokhbehsaim M. The role of adipokines in periodontal infection and healing. Mol Oral Microbiol 2014;29:258-69. Jain H, Mulay S. Relationship between periodontitis and systemic diseases: Leptin, a new biomarker? Indian J Dent Res 2014;25:657-61. Iwayama T, Yanagita M, Mori K, Sawada K, Ozasa M, Kubota M, et al. Adiponectin regulates functions of gingival fibroblasts and periodontal ligament cells. J Periodontal Res 2012;47:563-71. Singh MP, Chopra R, Bansal P, Dhuria S. Association between obesity & periodontitis – A clinical & biochemical study. Indian J Dent Sci 2013;2:6-8. Amrutiya MR, Deshpande N. Role of obesity in chronic periodontal disease – A literature review. J Dent Oral Disord 2016;2:1012. Palle AR, Reddy CM, Shankar BS, Gelli V, Sudhakar J, Reddy KK. Association between obesity and chronic periodontitis: A cross-sectional study. J Contemp Dent Pract 2013;14:168-73. Chaffee BW, Weston SJ. Association between chronic periodontal disease and obesity: A systematic review and meta-analysis. J Periodontol 2010;81:1708-24. Keller A, Rohde JF, Raymond K, Heitmann BL. Association between periodontal disease and overweight and obesity: A systematic review. J Periodontol 2015;86:766-76. Karthikeyan BV, Pradeep AR. Leptin levels in gingival crevicular fluid in periodontal health and disease. J Periodontal Res 2007;42:300-4. Yamaguchi N, Hamachi T, Kamio N, Akifusa S, Masuda K, Nakamura Y, et al. Expression levels of adiponectin receptors and periodontitis. J Periodontal Res 2010;45:296-300.